Nearly all examples of limestone begin their life as live sea creatures. In the case of chalk they are microscopic protozoa (single cell animals). Coral is composed of the skeletons of tiny multicellular animals. A limestone called coquina is composed of millions of sea shells and has a much coarser look. Travertine and tufa are crystalline deposits that form from the evaporation of dissolved calcium carbonate in caverns or hot springs. Over millions of years these deposits are compressed to form limestone, which can be fine or coarse grained, depending on the origin. One route that the life cycle of limestone can take is its metamorphosis into marble. It is formed over millions of years when limestone is subjected to intense pressure. Marble is usually a whitish color, but can often be colored with impurities. It is possible to make out tiny pieces of calcite when marble is studied closely. Compacted crystalline limestone can sometimes be mistaken for marble. Most limestone ends its life just lying in the ground as a sedimentary rock. However, it has been mined for centuries for building blocks. The Great Pyramid of Giza is made entirely from limestone, as are most of the artifacts that make up the tombs, statues and temples of ancient Egypt. Limestone can be seen all over the Uk and Europe as the material used for public buildings, and in medieval buildings and castles around the Uk. Pulverized limestone is the raw material used in the manufacture of quicklime, slaked lime and cement. 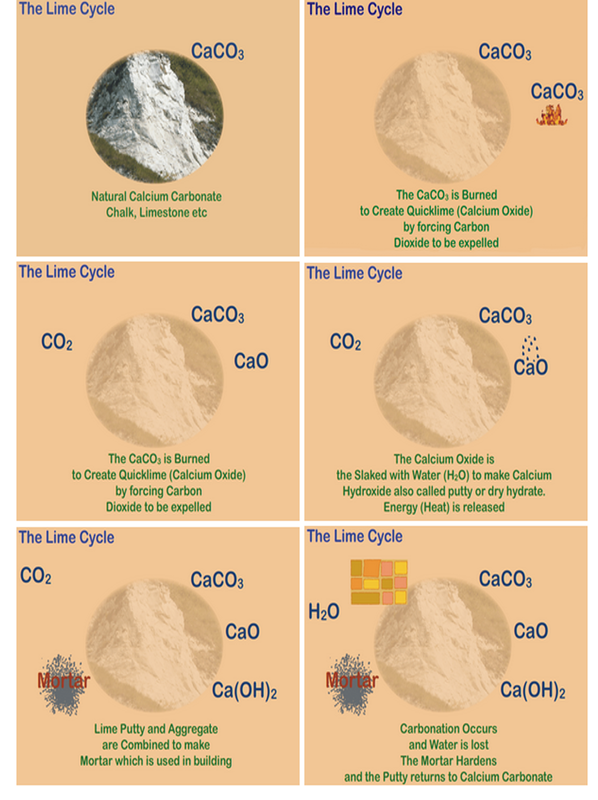 The images belwo illustrate the life cycle from calicum carbonate in a Limestone state to lime and back to calicum carbonate as a lime product in a building.